The Insulator Glass Collection Was Inspired By The Glass Relics That Adorned The Top Of Telegraph Lines At The Turn Of The 20Th Century. Acting As The Centerpiece Of This Series Is The Recognizable Shape Of The Glass Insulator, Made From Thick Clear Glass That Is Complimented By Solid Cast Hardware Designed With An Industrial Aesthetic. Finishes Include Polished Chrome, OiLED Bronze, And Weathered Zinc. - LED Offering Up To 800 Lumens (60 Watt Equivalent) With Full Range Dimming. Includes An Easily Replaceable LED Bulb (120V). The cornerstone of the satin Collection is quality, and this pendant is no exception. Combining a classic silver finish and posh styling, you will find no better way to highlight the charm of your home. With the superb craftsmanship and affordable price this fixture is sure to tastefully indulge your extravagant side. Geometric lines elevate the glamorous design of this decorative ceiling pendant light. The architectural panel features an open, asymmetrical framework crafted in steel and finished in dramatic black. Satin brass plated sockets draw attention to the five exposed light bulbs within the metal base, artfully arranged at every angle for enchanting illumination day or night. Incandescent bulbs included. The allure of this collection is the design of the champagne plated glass which has a symmetrical ripple pattern that exudes a brilliant array of light. Further accentuating the appeal is a band of alternating champagne and clear crystals that adorn the top of the glass. The metalwork is finished in Mocha which complements the hue of the glass. 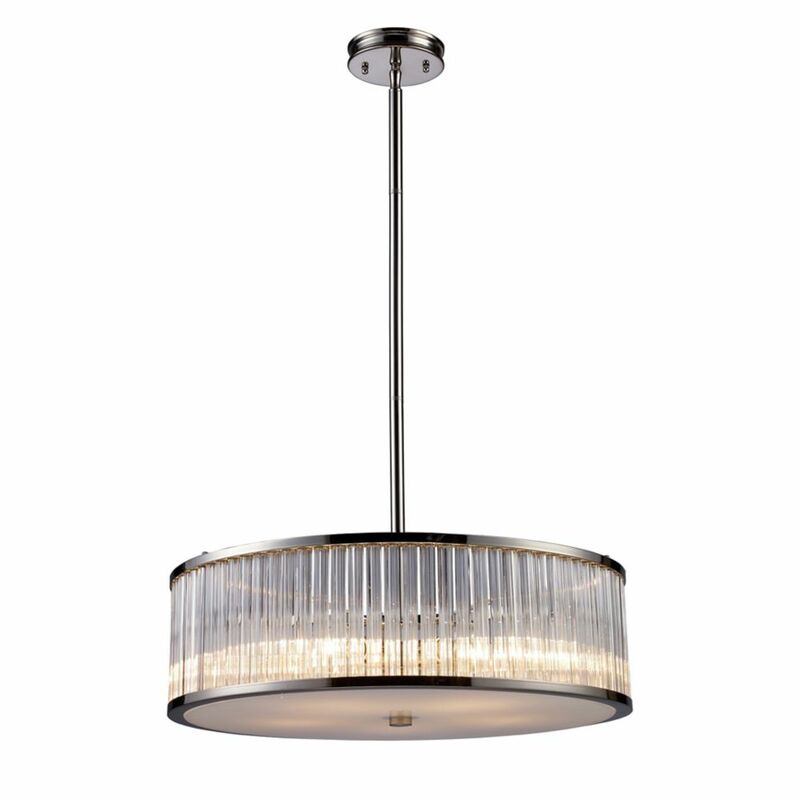 Braxton 5-Light Pendant In Polished Nickel The Insulator Glass Collection Was Inspired By The Glass Relics That Adorned The Top Of Telegraph Lines At The Turn Of The 20Th Century. Acting As The Centerpiece Of This Series Is The Recognizable Shape Of The Glass Insulator, Made From Thick Clear Glass That Is Complimented By Solid Cast Hardware Designed With An Industrial Aesthetic. Finishes Include Polished Chrome, OiLED Bronze, And Weathered Zinc. - LED Offering Up To 800 Lumens (60 Watt Equivalent) With Full Range Dimming. Includes An Easily Replaceable LED Bulb (120V).